The John Burroughs Memorial Locust and Wild Honey Orchestra will appear in concert at the Halcott Grange/TownHall Friday, June 3 at 7 p.m. The 3rd Annual Headwaters History Days will open and close with concerts of original and traditional music at the Halcott Grange Hallon Friday evening, June 3 and on Sunday afternoon, June 5 at the Andes D&N Depot. The shows are free. For a map, schedule and description of all weekend activities, visit www.headwatershistorydays.org. Both the Halcott Grange/Town Hall (264 County Highway 3, Halcott Center 12430), and the Andes Depot, at the base of Cabin Hill Rd. just outside the hamlet of Andes, are new (old!) venues this year. The Halcott structure was built in 1899 as a cooperative creamery, and became home of Greene Valley Grange in 1914. It has served as a polling place, meeting hall and community space for many years. The John Burroughs Memorial Locust and Wild Honey Orchestra will perform in this venerable hall on Friday at 7 p.m.. They will play original songs inspired by naturalist John Burroughs, the environmental conscience of the Catskills. 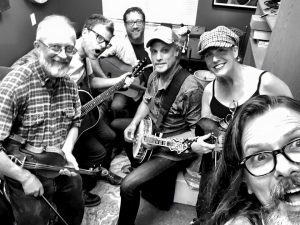 Performers will include Halcott resident Carrie Bradley Neves and John Jacobson on violin, Steve Koester of Arkville on guitar, Josh Roy Brown of Pine Hill on lap steel and guitar, Scott Hill and Aaron Lieberman. 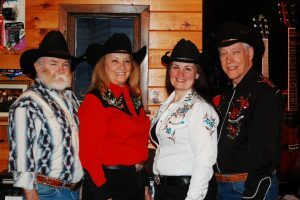 Country Express will perform at the newly refurbished Andes D&N Railroad depot Sunday, June 5 at 2 p.m.
Sunday’s concert in Andes will be by Country Express performing at 2 p.m. at the newly refurbished Andes Train Depot. Completed in 1907, the station served a spur line of the Delaware & Eastern (later Northern) Railroad, and carried milk, farm supplies and merchandise until 1925. The property was deeded to the Town of Andes in 1998. This is the first event in the newly renovated building. Country Express’s history-themed program, “Looking for the Past,” features original songs written by the late Rob Laing, founder of the band. The songs tell of building the D&N Railroad, the demolition of four villages in the East Branch Valley in order to create the Pepacton Reservoir, and the Anti-Rent War resulting in the death of undersheriff Osman Steele. There is a light-hearted story of city folk arriving in the Andes area as well as songs highlighting the beauty of the Catskills. Terri Whitney, Darlene and John DeMaille and Larry Jamieson will blend their voices and instrumental talents for a memorable, heartfelt program. A history walk on the adjacent Andes Rail Trail with railroad enthusiast Russ Kaufman will precede the concert at 12:30. Parking will be on an adjacent lot. For more information about HHD events, contact Doris Warner at 845-586-2484.